2. Take the Dandridge Walking Tour through our Historic Downtown. 3. Come and enjoy Music on the Town held every Thursday evening in September behind Town Hall. 4. Visit the “Million Dollar Dike” and see the structure that saved the Town from flooding in the 1940’s when the lake was enlarged to create power for Oak Ridge during WWII. 5. Take the Self-Guided Walking Tour of the Revolutionary War Graveyard and see where the area was originally settled. 6. Rent a boat, kayak, or paddle board for a day of fun on the lake, then enjoy an evening of lakeside dining at the Point Marina. 7. Visit the Field of Dreams Activity Center for a workout or enjoy one of the many sporting events at the Field of Dreams. 8. Hike through the TVA Hiking Trail across from the Point Marina and enjoy breathtaking views of Douglas Lake. 9. Shop in one of our many boutiques or antique stores in the Downtown District. 10. Visit one of our Special Events / Festivals. From Shakin’ the Lake to the Scots-Irish Festival to Music on the Town Dandridge, TN offers an event that the whole family can enjoy in every season. Also, the area has many activities for you to enjoy the outdoors in the foothills of the Smokies! There are three public golf courses within a twenty (20) mile radius of the town’s corporate limits. Each one features Bermuda fairways and bent grass greens. Patriot Hills Golf Course, www.patriothillsgolf.com, is the newest golf course in the area, opening in the spring of 1997. Patriot Hills has a 3.5 star rating by Golf Digest and is regularly voted as having the best greens in East Tennessee. Dandridge Golf and Country Club, www.dandridgegolf.com, opened in 1980 and features twenty-seven (27) holes, eighteen (18) of which were designed by Dan Maples. Dandridge Golf and Country Club offers an enjoyable round of golf, regardless of the golfer’s proficiency. Baneberry Golf and Resort, www.baneberrygolf.com, was opened in 1974. In addition to a well-manicured golf course, Baneberry has motel efficiency units, two bedroom villas along the fairways, and a high quality restaurant in the clubhouse, which makes an extended stay worthwhile. White Pine Golf Club, www.whitepinegolfclub.com, has been in business for the last 38 years. This nine hole course is fun to play, and is an economical way to spend a few hours or all day. In addition to a magnificent round of golf, these courses offer you panoramic views of the Smoky Mountains and Douglas Lake, a moderate climate year (average daily highs from 46º in January to 89º in August), and an occasional sighting of deer and other wildlife grazing in the fairways. 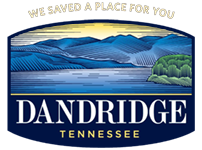 Nestled in the foothills of The Great Smoky Mountains National Park, Dandridge is about an hour drive from one of the most visited national parks in America. The park is renowned for its bio-diversity, the beauty of its mountain range and its Southern Appalachian mountain culture. A hiker’s paradise with short and strenuous trails, the Park also offers camping, fishing, picnicking and auto touring. The Park offers Ranger-guided tours in spring, summer and fall. The Great Smoky Mountains National Park is considered a hiker’s dream with over 800 miles of maintained trails. The Park is a sanctuary for an array of wild plants and animals, including bears deer and elk. Some treks may require backcountry camping. Jefferson County is all about the great outdoors! It has Cherokee Lake on its northern border and Douglas Lake on its southern border attracting visitors who enjoy swimming, camping, fishing, skiing and boating. The Douglas Reservoir is located at the foothills of Smoky Mountains on the French Broad River and provides 555 miles of shoreline and about 30,400 acres of water surface for recreation activities. It attracts more than 1.7 million recreation visits a year. Both Douglas and Cherokee lakes have similar fish populations offering anglers crappie, black crappie, largemouth bass, black bass, small mouth bass, walleye and channel catfish. Although there is no closed fishing season, fish bite best from April to October. For more information about fishing tournaments on Douglas Lake contact Bucks-N-Bass at 865-397-6455. Both lakes have several access areas, docks, camping areas and full service marinas. They are patrolled by TVA’s Public Safety Service and the Tennessee Wildlife Resources Agency. For the latest information on lake levels and stream flows contact TVA’s Lake Information Line 1-800-238-2264 or 865-623-2264. Tennessee hunting and fishing licenses may be purchased in the Jefferson County Clerk’s office located at the Court House in Dandridge and other locations throughout the county. Tennessee residents over 65 are not required to buy a license; but if requested, they must prove their age and residence. Douglas Lake also offers pontoon, Jet Ski, bass fishing boat and paddle boat rentals, covered and open boat slips, and dry stack facilities. Horseback riding, English and Western riding instructions plus an “Equestrian Summer Camp” for children are also available in Dandridge. Overnight stalls and accommodations are available for those transporting or traveling with horses on I-40.